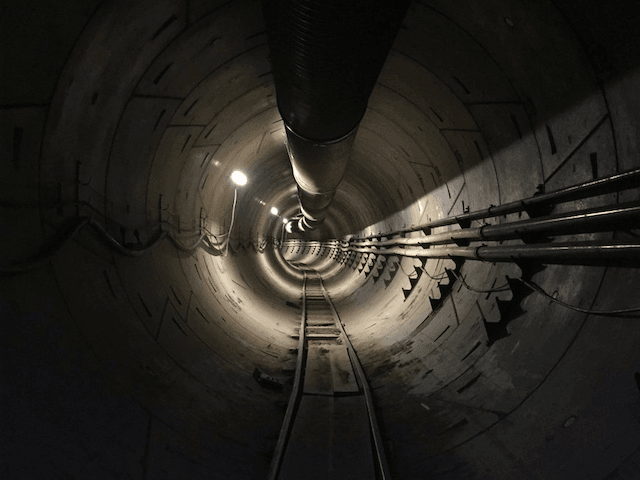 The Boring Company’s tunnel under the SpaceX rocket factory in Hawthorne, California is a proof-of-concept demonstration of the progress Musk is making at integrating his four uniquely focused companies to solve intercity congestion headaches, as he described at the April 2017 TED Conference in Vancouver. Through a system of robotic transporter sleds that will lower vehicles to underground tunnels, which will in turn whisk them to their destinations at 130 miles-per-hour, Musk claimed that he could cut the travel time for the eight-mile trip from downtown Los Angeles to Westwood from 40 minutes to to five or six minutes. Musk moved to the U.S. at age 24 to earn a Ph.D. in applied physics and materials sciences at Stanford, but he dropped out to pursue entrepreneurial aspirations in the areas of the Internet, renewable energy, and outer space. He has stayed true to his dream as a founder of PayPal, Tesla, Hyperloop, SpaceX, and the Gigafactory. Musk sees the coming approval of so-called “autonomous vehicles” (driverless cars) within the next four years as kicking off a highly competitive market-share grab for trillion dollar markets among existing and new ride-hailing companies. But autonomous vehicles are an existential threat to ride-sharing, because businesses will offer services at a price trending toward cost. ReThinkX estimates that this new environment will be dominated by integrated multi-national automakers that will leverage their economies of scale cost advantages to build in-house fleets that can cut the cost of transportation for most urban and suburban residents by a factor of four to ten times cheaper per mile. That amounts to an annual savings of for an American family of $5,600, or about $1 trillion for the nation. Disruptively low costs of transportation per mile will force private and public transportation companies to begin merging to capture huge revenues from advertising, entertainment and product sales. Hyperloop tunnels give Musk a huge competitive advantage in the coming competitive environment where urban transportation is sold by the mile. He will have an edge over legacy roads that are already highly congested and were not designed to be efficient cross-town corridors. Musk’s vision combines Tesla-made electric vehicles, utilizing Hyperloop cross-town tunnels, and electrified by Gigafactory batteries, to reach SpaceX’s launch pad.